The French Paper Company hits just keep on coming. Posters, swatch books, and a myriad of promotional pieces. Part 1 of the promos come in book or booklet form. To describe each and every one would be too tall of a task... and it's ironic the amount of work went into these projects, whereas I'm not willing to spend several hours to describe them. In any case, just seeing the range of design and production that has gone into this work should convey something of the enormity of what it takes to really build a brand. It's often talked about and aspired to, but rarely is brand building achieved like the Charles Spencer Anderson Design Co. has done so here. One other note: when faced with problematic clients, design teams can justify sub-par work by stating "Even the good guys have to do crappy work some time". After sifting through these samples it's gratifying, and an inspiration to know that high standards can be applied to every job, and not just as a situational occurrence. 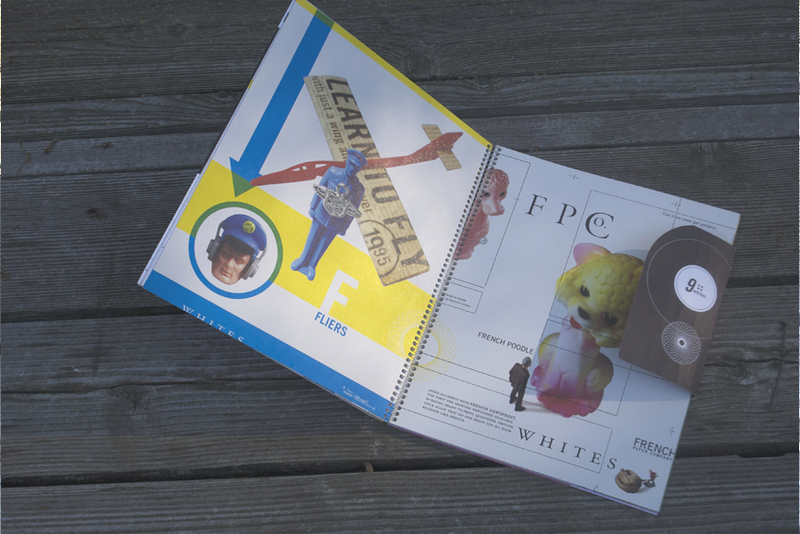 FPC Datebook. Apologies for the crappy photo. 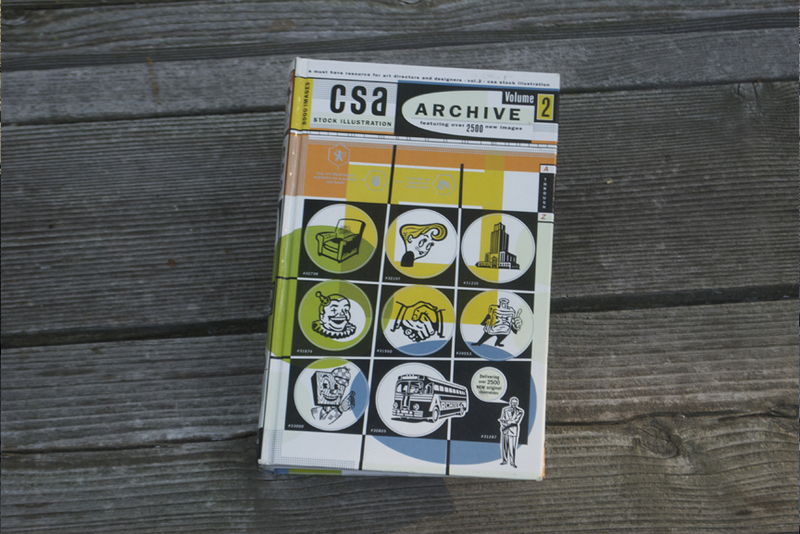 CSA Stock Art Catalog. Not for FPC, but cool nonetheless. Super cool, actually. CSA Stock Art Catalog 2. Told you it was cool. More recent FPC promos. Still shrink-wrapped for higher re-sale value! SET 1 exteriors, type and graphics embossed. It was a real treat to open up a flat file and rediscover the stack of French Paper Company posters that had accumulated (see previous post). As opposed to being buried, the swatch books that I've acquired and saved over the years have always been laying about and within easy reach. I don't get a ton of opportunities to order French papers, but the swatch books have always been on a shelf, in sight. Maybe they're a form of status symbol. Although I don't often have anyone other than my wife and family in proximity of my work area, you never know when a designer in-the-know will stop by, and one wants to project the illusion of high-grade professionalism, does one not? The posters are beautiful, but after re-acquainting myself with the swatch books, it's apparent which is the dog and which is the tail. The swatch books have a function, each contains color and weight samples of the line that it promotes. Undoubtedly another function is brand-building and radiating ultra-coolness, which is a mainstay from the earliest to the most recent designs. From the visual standpoint alone the evolution of the branding is apparent. A simple, utilitarian clip art approach slowly becomes, well, whatever someone more articulate than me would call the latest design approach. What doesn't come across in these photos is the tactile aspect and the production value of the swatch books. The printing of ink is the baseline, but the other techniques are what make these so unique. Type, imagery and even textures are often embossed and de-bossed. Additionally, some kooky foil stamping (or perhaps super thick varnish?) is also used liberally throughout. The binding is also unique on all. So these not only look great, but the feel of them is memorable as well. It would have been interesting to listen in on the conversations where Charles Spencer Anderson and his design team were justifying the cost and the necessity of these techniques when presenting them to their client. I'll have to wait for the book and the movie to come out to get the inside scoop. SET 2 exteriors. These have a really nice varnish/stamp technique with the tone on tone background pattern. SET 2 interior spread: Copywriting run amok, in a good way. SET 3 exteriors. Again, not visible here, but some nice embossing going on to enhance the design. SET 4 exteriors. On all but the Smart White there is some industrial strength, glossy coating on all of the black ink. SET 5 exteriors. Totally devoid of the vintage line art, yet nonetheless uber-French. The background patterns are embossed--- and the binding is most unique.